One of the most exciting parts about starting a garden is picking out the plants that you want to go into your garden. You probably do have a lot of plants in mind already before you even narrow that list down. Of course it would be really wonderful if your garden could have something that is out of the ordinary, meaning that your garden has plants that you do not commonly see growing in your area. Truly, the idea is amazing. However, one of the biggest considerations in picking out the plants that will grow in your garden is whether the plants would fare well in your growing zone. The whole planet is actually divided into growing zones. Different species of plants grow and survive in different growing zones. Even if you want a plant from another growing zone so badly to grow in your garden, the fact is that if ever it does survive the new environment there is no guarantee that it will grow as beautifully as it does in its native growing region. Almost all plants and their respective seeds come with a catalog that indicates its respective growing zone where the plant is expected to grow best under the normal condition of that specific region. 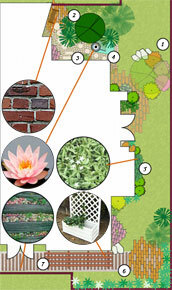 The catalog also indicates other growing zones that a plant can still make it or simply grow satisfactorily. It is important that one knows about growing zones prior to planting in order to avoid investing on plants that do not grow well in the region you live in. Growing zones are synonymous with climate zones and plant hardiness zones. As was said earlier, the entire world is divided in different growing zones. The USDA divide the entire US into growing zones and it has devised a color-coded and numbered map indicating the growing zones. Other countries have maps of their respective growing zones as well. The maps can easily be downloaded over the internet and you can get them for free. The defining factor of a climate zone is what the lowest annual temperature is in the winter. If a plant can survive that temperature and still come back and thrive then it’s considered ok to be planted in that zone. When picking out the plants to grow in your garden, do mind the growing zone you are in. Apart from that, it also helps to learn more of the condition of the soil, the temperature, the length of daylight during different seasons before picking out the plants because these do have a drastic effect on their growth too. By considering them, you can at least come up with a list of plants to grow that will grow well in the package presented by the environment in your region. Growing something out of the ordinary might be a really exciting idea. In fact a lot of people are even keen to bring the beauty of the Hawaiian tropics right close to their homes by creating a tropical garden. Sadly, the tropics are an entirely different growing zone. Should anyone wish to pursue creating garden reminiscent of foreign land can best make us of the growing zone map and find plants that closely resemble to the ones they are looking for and still grow well in your growing zone.